System because it improves the health of our most visible organ, the skin. After years of working with thousands of clients, I have found that an important part of feeling good is looking good!! November 3, 2007. The exhibit was titled: "Feeding the Skin from Within... and Without". Carmen Fusco is a Research Scientist with a Master of Science from New York Medical College. Carmen Fusco is a Clinical Nutritionist with an office in Manhattan. Carmen Fusco was elected an Associate Member of Sigma Xi The Scientific Research Society in 2004. Preventative Medicine, New York Medical College (1990). Carmen Fusco is a long time member of Center for Science in the Public Interest. and New York Medical College. Carmen Fusco has lectured at Stony Brook School of Medicine. 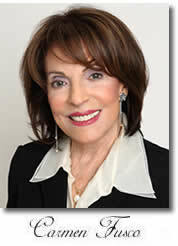 Carmen Fusco has served on the Advisory Board of Life Extension Foundation since its inception. the monthly column Ask "Anti-Aging News". it was also published in Japanese. (1986) and the American Journal of Clinical Nutrition (1988). magazine where she is described as "a nutritionist who saves lives..."
in Science and Engineering, Who's Who in Executive and Business. Ultra Rejuvenex® Skin Care System. Designed and reformulated the Hi-Power Multi-Vitamin Mineral Antioxidant formula. Advancement of Science, and the Clinical Nutrition Research Unit in New York.